Mesa High's boys basketball team is back on top after a 16-year absence, but the return wasn't easy. Top-seeded Mesa overcame a furious rally by 14th-seeded Desert Vista to pull out a 54-46 win in the state 5A championship game Thursday night at America West Arena to claim the school's first state title in basketball since 1988. The Thunder trailed by 14 points at the start of the fourth quarter but cut the lead to one point twice before finally succumbing to the Jackrabbits. 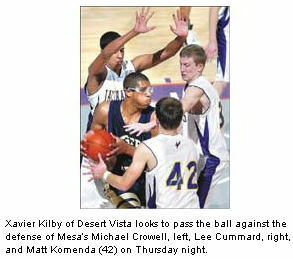 "That says a lot about Desert Vista but it says even more for our guys to weather it," Mesa coach Shawn Lynch said. "It was tough. Just tough." The win capped a remarkable run for Mesa (28-3). The Jackrabbits have held the top spot in the rankings since taking down then-undefeated Mountain View on Jan. 16 and have not dropped a meaningful game since a one-point loss to Marcos de Niza on Dec. 4. The only blemish on their record since was a loss to Mountain View after the Jackrabbits had wrapped up the top seed at state. The run included 25 victories, all but five of them by double figures. “It feels amazing. I've been waiting for it my whole life,” said senior Lee Cummard, who led all scorers with 16 points. "We're the best team I've ever seen." Desert Vista (20-13) closed out the season with a run of its own, winning seven straight games, including state tournament upsets of Highland and Mountain View. The Thunder looked like they might have had one more upset in them when they put together one final charge against Mesa. With Cummard on the bench with four fouls, Desert Vista went on a 13-0 run to close within one point of the Jackrabbits with under five minutes to play. Hatch and Matt Komenda finally put their opponents away. Hatch assisted on a Komenda layup and hit 4-of-4 free throws in the final 35 seconds as the Jackrabbits scored the final seven points of the game. Komenda also hit a free throw in the closing moments. Both times Desert Vista cut the lead to one point in the fourth quarter, it was Komenda who pushed the lead back to three. "It's a team game and the team showed up tonight," Cummard said. The loss was tough to take for Desert Vista's seniors, who have seen their final seasons end at America West Arena. The Thunder fell to Highland in the semifinals in 2002 and lost to Gilbert in last year's title game. "It's real disappointing. I can't even describe it," senior Travis Gabbidon said. "We were in the game. We just put ourselves in too big of a hole." More accurately it was Cummard and the Jackrabbits who put the Thunder in the hole. Mesa used a pair of 9-0 runs, one with Gabbidon on the bench with two fouls early in the second quarter and the other to close out the third period. Seniors Michael Crowell and Akim Jackson got the third-quarter run started on a pair of transition layups, and Cummard capped the streak with a 3-pointer from the wing and a driving turnaround jumper. Then in the span of 45 seconds, Cummard picked up his third and fourth fouls and went to the bench for more than two minutes early in the fourth quarter. Cummard's absence energized the Thunder. Senior Chris Gray hit a pair of jumpers and fellow senior Xavier Kilby scored on two offensive put-backs as Desert Vista trimmed the lead to one point. The comeback was symbolic of the entire season for Desert Vista, which started out 11-11 before winning 10 of their last 11 to advance to the championship game. "It was a great last half of the season," Gabbidon said. "We surprised a lot of people, we just couldn't get it in the end."